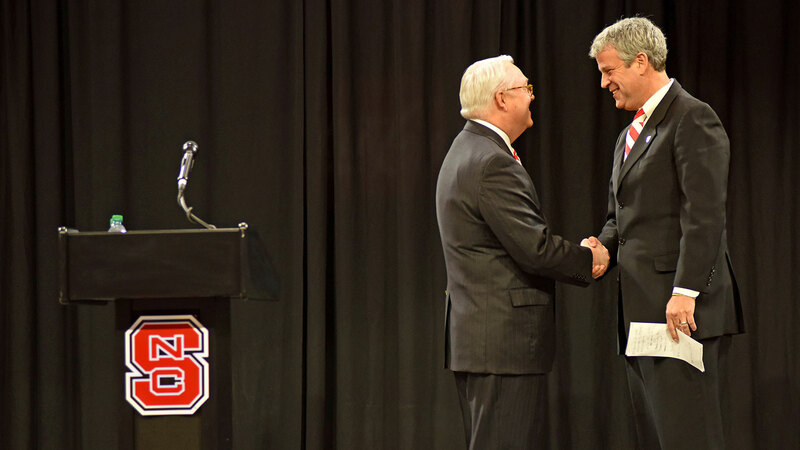 Current Army athletics director Boo Corrigan assumes his new role at NC State May 1. 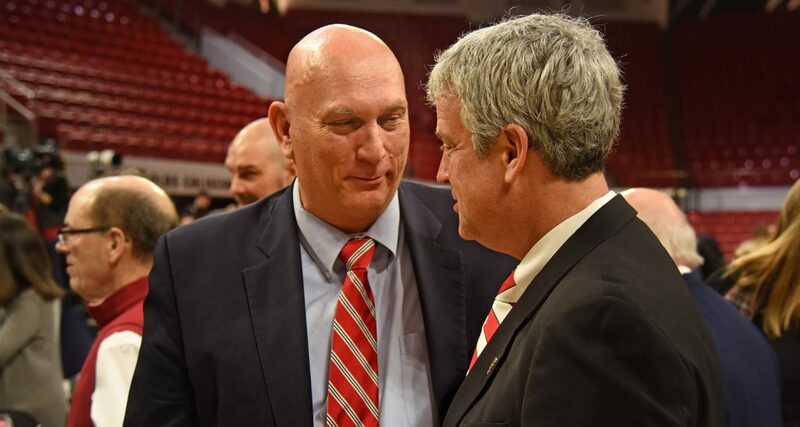 Chancellor Randy Woodson, left, greets Boo Corrigan at Reynolds Coliseum Thursday. When Boo Corrigan heard a year or so ago that current NC State athletics director Debbie Yow planned to retire midway through 2019, he looked at his wife Kristen with a raised eyebrow. “That’d be a great place,” he said. 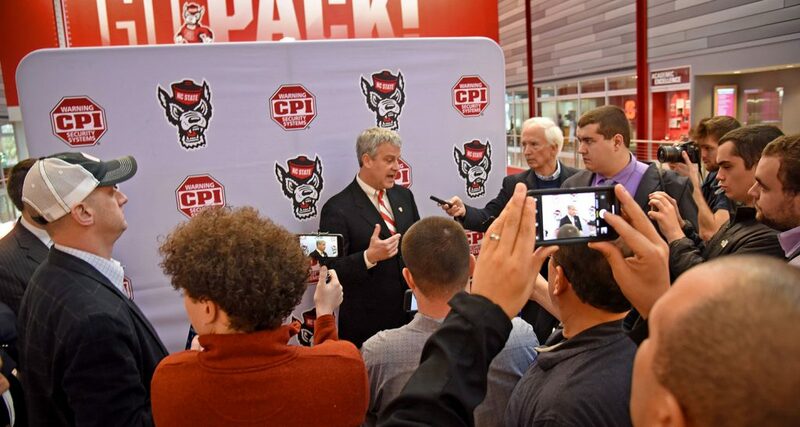 So two weeks ago, when he was first contacted on behalf of NC State chancellor Randy Woodson, he was eager to learn more about the opportunity to become Yow’s successor as the school’s 14th official leader of the athletics program. “It’s a place that can keep building on its current success,” Corrigan said. Eugene Francis Corrigan Jr. – he’s had the nickname “Boo” since birth – was introduced Thursday in the James T. Valvano Arena of Reynolds Coliseum to the media and the university community, flanked by Woodson and endorsed by the university’s board of trustees. He’ll officially start May 1. The youngest of seven children of former Atlantic Coast Conference commissioner Gene Corrigan (1987-97) and wife Lena, Boo Corrigan has an extensive background in college athletics, particularly in the ACC. A graduate of Notre Dame, he worked at Florida State, the U.S. Naval Academy, Notre Dame and Duke before becoming the athletics director at the United States Military Academy on Feb. 1, 2011. He has clear intentions of the kind of department he wants to represent the university, as one of its most prominent external operations. “I want everyone to be proud of who we are,” he said after the introductory news conference. “[Athletics has] the ability to bring people together. We have the ability to celebrate the institution. That’s really where sports intersects at the biggest and broadest level. You want teams to represent the school in a way that will give you pride while you are there. Boo Corrigan meets the press at Reynolds Coliseum. It’s been a whirlwind three days for the 52-year-old father of three. He arrived in Raleigh Tuesday night just as the NC State men’s basketball team started its overtime period against Virginia, stopping with everyone else at an airport television to watch the final few minutes. He spent Wednesday meeting with university administration, athletics department personnel and coaches. And Thursday, he was joined by his family to be introduced as the newest members of the Wolfpack in an open news conference. In addition to Woodson, Corrigan had some hefty supporters, namely retired four-star U.S. Army General Ray Odierno, who owns an NC State graduate degree. The former Chief of Staff of the Army and passionate college football fan now lives in Pinehurst. U.S. Army General Ray Odierno, left, welcomes Corrigan to NC State. 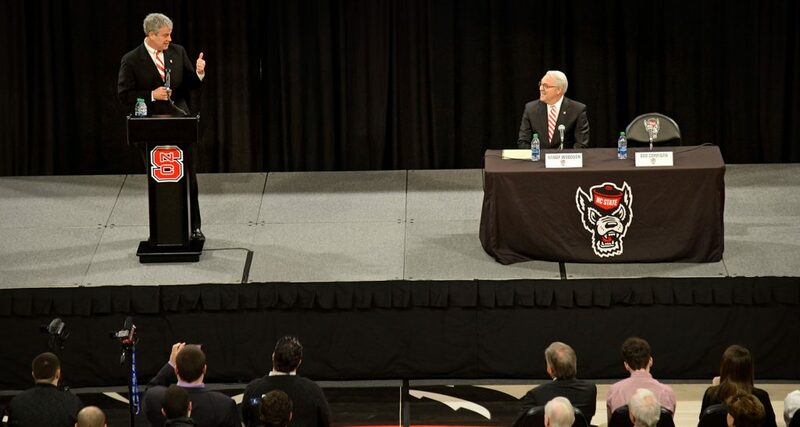 “NC State a perfect fit [for Corrigan],” Odierno said. “At West Point, obviously, leadership development is the most important thing. At NC State, the culture of developing young leaders is very important as well, as the chancellor has made clear during his time here. Woodson began the introductory news conference by giving high praise to Yow for raising the profile of the athletics department during her nine-year tenure, which will conclude at the end of April. Among her notable achievements was hiring 17 coaches, refurbishing Reynolds Coliseum and adding an NC State Athletic Hall of Fame, the construction of the Close-King Football Practice Facility and moving the department from No. 89 in the Learfield Directors’ Cup standings into the top 15. “It’s a phenomenal tribute to her leadership of where we are at NC State right now,” Woodson said. “It’s a tribute to hiring great coaches and a tribute to the hard work she and her team have done over nine years. Woodson began the search for the school’s next A.D. last year, hiring Parker Executive Search in Atlanta to handle the details quietly. He gave three criteria for the search. “First and foremost, I wanted an athletics director that put the student-athlete first in everything they do: their health, their safety, their education,” Woodson said. “Secondly, I wanted someone that has been successful at the highest level of college athletics, an experienced athletics director. 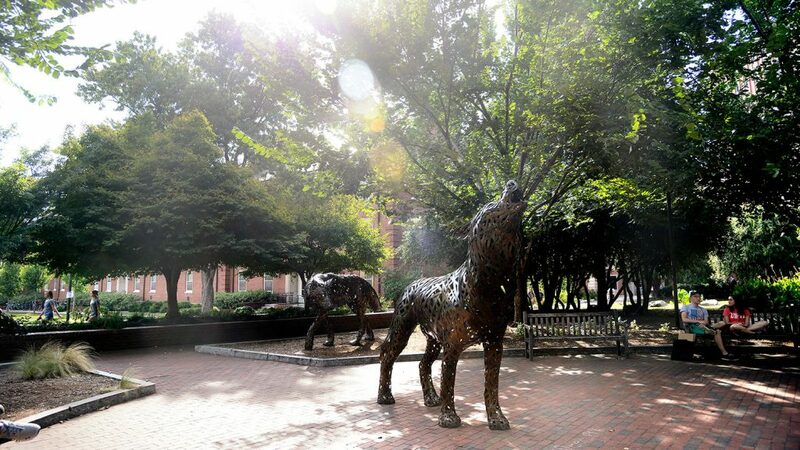 Third, something that is as important to me as it is to the people here today, someone passionate about NC State. Boo Corrigan and Chancellor Randy Woodson share the stage at Reynolds Coliseum. 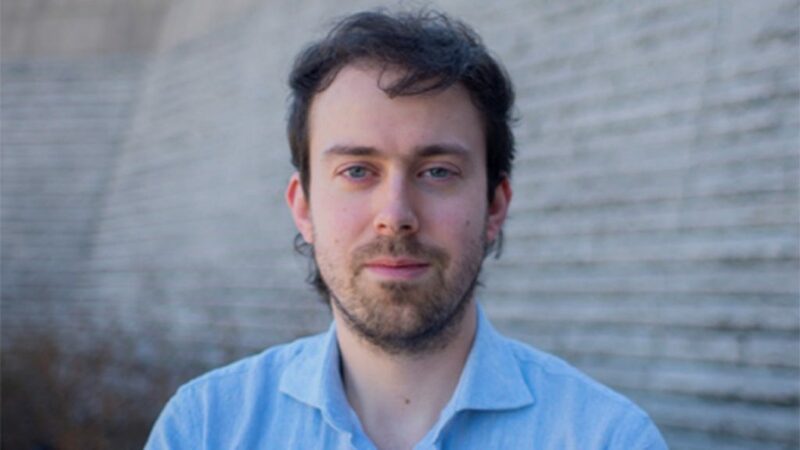 Those criteria aligned well for Corrigan, who identified his four tenets for success as trust, accountability, passion and empathy. With his long background with college athletics, he strongly believes that he and NC State are a perfect fit. “You want to be a part of a winner,” he said. “You want to be part of a place that does it the right way. I could not be more proud to be here. “I want everyone to be proud of who we are…”. Well said, Boo. Consistent with that, let’s show some class and humility by decreasing the size of Tuffy’s head on the basketball court! That thing almost extends the width of the court! Look at some other first rate Division 1 home courts to get some size comparisons.